I came across a woman recently who was considering chapter 7 bankruptcy. She had a home that was underwater by more than $175,000. She had absolutely no intention of keeping the home. Her goal was to stay in the home for as long as possible, surrender it to the lender after a sheriff sale, and eliminate or discharge the underlying debt through chapter 7 bankruptcy. This sounded like a good plan until we examined her assets with a high level of scrutiny. The first hurdle that we had to get over in terms of assets was her numerous vehicles. She had two relatively old vehicles which were not going to pose a problem. One was a 1998 Chevy which was worth approximately $500 and the other was in 1999 Ford which was worth approximately $1000. She had two other vehicles which would be more difficult to protect. One was a 2004 Toyota worth approximately $2500. The other was a 1980 Chevy Corvette which had a value of approximately $3000. When we looked at her vehicle equity in aggregate, she had approximately $7000 worth of auto assets. Illinois law allows her to protect up to $2400 of equity in one vehicle. She also has a $4000 miscellaneous wildcard exemption which she can sprinkle over any personal property. Thus, she can escape the long arm of the trustee by protecting all of her vehicles by utilizing the proper auto exemption and wildcard exemption. So far, so good. The second and more difficult hurdle is the cabin and associated land held by the debtor outright. The cabin has a value of anywhere between $5,000 and $15,000. It is very hard to get a fair market evaluation of said cabin due to the fact that there are very few sales over the last 10 years. These cabins have electricity, yet no other amenities. Families purchase these cabins, keep them in the family and pass them down from generation to generation in many cases. In addition to the cabin, there are 7 acres of vacant land connected therewith. The vacant land has a value of anywhere between $5,000 and $10,000. Thus, on the low end, the debtor has approximately $10,000 in equity between the two items. On the high side, the debtor has approximately $25,000 of equity. This amount of equity is too great to risk in a chapter 7 bankruptcy case. If the debtor were to file a chapter 7, the trustee would be able to contact a local realtor, list the cabin and the vacant land for sale, and liquidate the property for the benefit of creditors. Since the debtor already has significant equity in vehicles which is being protected by the wildcard and the auto exemption, there would be very little or nothing to protect the cabin and the land. Since she does not live in the cabin, she is not able to utilize her homestead exemption. Additionally, the cabin is in a separate state from her home state. Thus, she would not even be able to make a plausible argument that the cabin is in fact where she resides. For the reasons stated above, it makes better sense for the debtor to file a chapter 13 reorganization case. Since she has approximately $30,000 in credit card debt, the creditors would get less than the full repayment when filing chapter 13. The amount that the creditors would receive would be primarily dependent upon the liquidation value of the cabin and the adjacent land. If the value of the cabin and adjacent land totals $10,000, then the creditors would receive approximately a 30% payback over a 3 to 5 year period. Additionally, the debtor would be able to protect all of her assets. This would include the vehicles and the adjacent land. 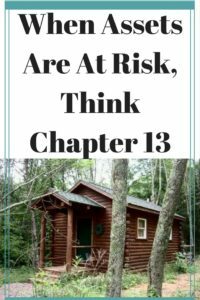 If the debtor was unable to make the chapter 13 plan payments, the worst thing that would happen is the case would be dismissed. The debtor would still retain all of her property and she would be able to deal with her creditors separately. The take away from this article is straight forward. If you have assets that are subject to being taken by a trustee due to the fact that the assets exceed the amount exemptible or protectable under your state law, then consider chapter 13 to protect those assets. Otherwise, you run the risk that a chapter 7 trustee will attempt to liquidate your assets in an effort to pay your creditors. For more information on chapter 13 and your rights, you may contact my office at 847-520-8100. You will speak directly to an experienced, bankruptcy attorney about your personal financial matter and it will be handled in confidence.